Part of our mission at David Mitchell is to ensure our clients make the best move when it comes to financial decisions. Throughout years of construction practice and hundreds of dental offices we built, we have gained the necessary expertise in feasibility studies and have established ourselves as authorities in this field. We have met and enjoyed working with over 100 dentists, and have been involved first-hand in the setup of many of their operations. This means we must recognize the value in a vision for the building process that involves the most economically feasible and sustainable solution. 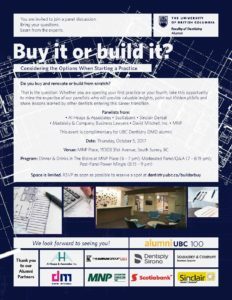 On October 5th, 2017 our president and CEO will share his 30+ years of experience on this matter to discuss the pros and cons of buying and renovating a practice versus building it from scratch at ubc.eventsair.com.